Bringing a breath of fresh air to the gloomy state of affairs of the Indian football team at present is the news that the Indian boys U 14 football team has won the IMG Cup in the U15 division at IMGacademy in the United States. The team which is being sponsored by IMG Reliance for a period of one year has been training at the IMG academy since September. 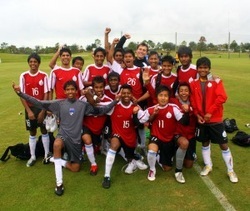 The team which consists of the wonder kid Uttam Rai of Delhi has since their arrival regularly defeated the IMG Academy team by big margins in a couple of friendlies played earlier. However this was their first big test since their arrival at the academy and the team has done justice to their potential. In the first game against FC Kraze the team had a 1-1 draw. However it was a round robin format and by winning their final game 3-2 against the Elite Fusion football club, the Indian boys clinched the trophy. Braving the chilly rains and gusty winds the team clinched the victory in extra time after both the teams were level after regular time. Hopeully this win will give the boys a lot of confidence and prepare them for the sterner tests ahead when they participate in the asian u-16 qualifiers next year.